While the words "mashed cauliflower" may not sound particularly attractive, the recipe is delicious, healthy and low in all of the things you don't want. It's a popular substitute for mashed potatoes on low-carb, low-starch and low-glycemic diets, and it can fit into just about any diet plan or program. 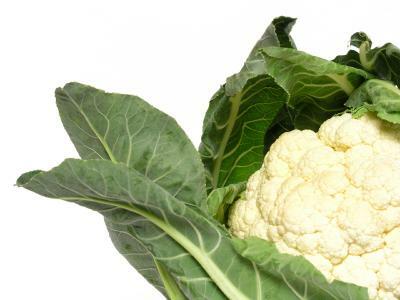 Remove leaves and core from cauliflower and steam along with one to two cloves of garlic (or more, if desired). It helps the cauliflower steam quicker if you rough chop it a bit instead of dumping huge florets in your steamer. When cauliflower and garlic are soft (about 20 minutes later), pulverize in your food processor until mushy. Add in a couple of tablespoons of the steamer water and the mayonnaise and run in the food processor until smooth. Add cheese and salt and pepper and run until smooth. If you don't have a steamer in your possession, you can use a colander and a pot instead. Simply place a metal colander in a pot of water and place the pot's lid over the colander. The pot shouldn't be too big however, and the colander shouldn't touch the bottom of the pot. You can also boil the cauliflower, which cuts the cooking time in half. If you do this, you may not need to add the cauliflower water to help smooth it out. When you're done, the cauliflower should look like cheesy mashed potatoes. Delicious! If you've never been a fan of cauliflower, be prepared to be surprised. The cheese and garlic in this recipe make all the difference. Try it for yourself, and see just how tasty this strange-sounding dish really is!